I’ve never liked lemon meringue pie. There’s just something about the softness of the meringue on top that doesn’t do it for me. Meringue cookies, however, are a completely different story. A hard exterior gives way to a soft middle that melts in your mouth like cotton candy. They’re like little puffs of flavored sugar, and I’m pretty sure they appeal to that inner kid in all of us. Strawberries finally tasting good again is the first sign that spring is truly underway (thank goodness!). I can’t think of a better way to celebrate them than with mini meringues for a delicate dessert you won’t be able to resist. 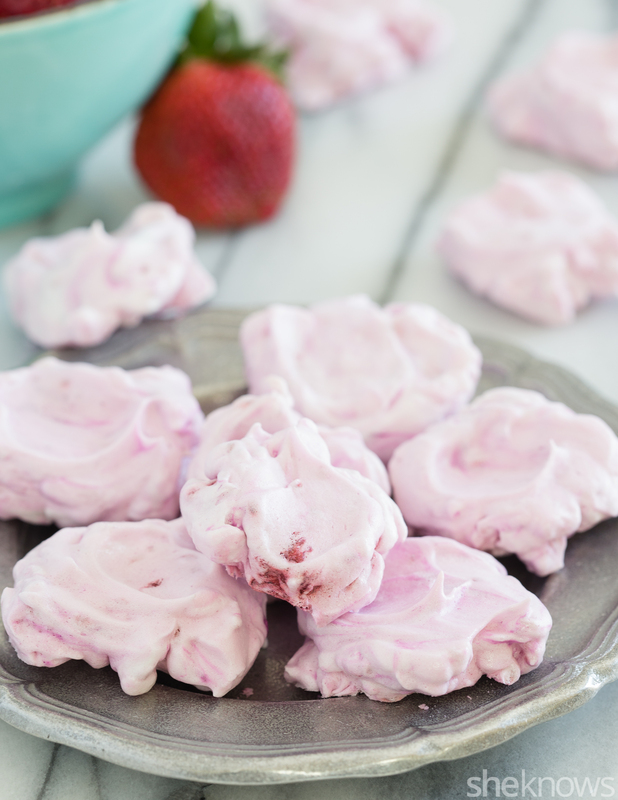 Don’t be fooled into thinking meringues are difficult to make. These little puffs of pink couldn’t be easier to throw together. Preheat the oven to 300 degrees F, and line a baking sheet with parchment paper. To the bowl of a stand mixer, add the egg whites and cream of tartar. Beat on high speed until frothy and just starting to form soft peaks, about 2 to 3 minutes. Gradually add the sifted sugars, and continue beating on high speed. Beat until glossy and stiff peaks form, about another 3 to 4 minutes. Add the vanilla extract, and beat a few seconds more to incorporate. To a small bowl, add the strawberry jam. Add about 1/2 cup of the meringue to the jam, and fold together until just incorporated. 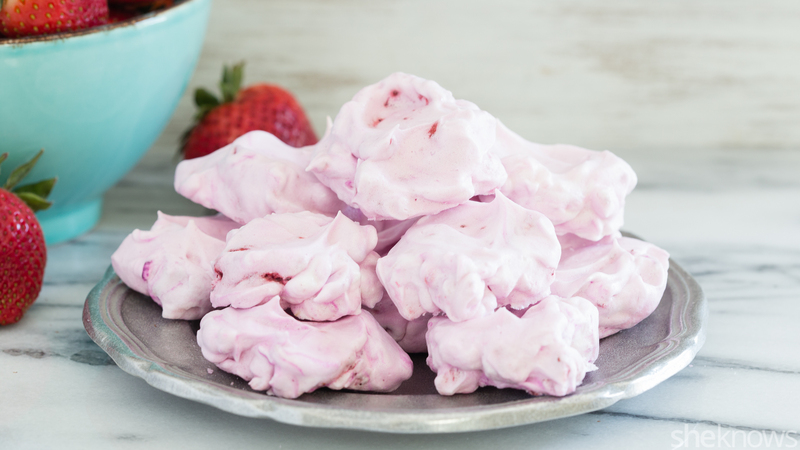 Place the meringue with the strawberry jam back into the mixing bowl, and gently fold everything together until the strawberry jam is barely incorporated into the full meringue mixture. Scoop about 2 tablespoons of the meringue onto the baking sheet until all the meringue is used up. Place the baking sheet in the oven, turn off the oven, and let the meringues sit for about 2 hours or until the oven is fully cooled. The meringues should be hardened to the touch. If they’re still a bit soft, just let them sit a while longer. They will eventually stiffen up.